Diese Seite verwendet Cookies um das Nutzererlebnis zu steigern. Mehr Informationen dazu finden Sie in unseren Datenschutzbestimmungen. Policylead bietet eine Plattform für Politikbeobachtung in Deutschland und Europa. Wir helfen Analysten, die Gesetzgebung zu verfolgen und Themen tagesaktuell zu beobachten. Mit intelligenter Software identifizieren wir Trends und Influencer für alle Politikfelder. Policylead verfügt über eine Datenbank mit tagesaktuellen Dokumenten und Einträgen aus Parlamenten, Behörden, den sozialen Netzwerken, von Verbänden sowie überregionalen und regionalen Medien. Der Umfang unserer Datenbank ist nicht limitiert. Wir erweitern fortlaufend unseren Quellen-Index, um unseren Kunden für alle Themen ein vollständiges Nachrichten- und Politik-Monitoring anbieten zu können. All content on this website is protected by copyright of Future Leads Publishing GmbH. Any content published here, such as database entries, corporate layout or editorial content may only be used with the written consent of Future Leads Publishing. In particular, the content of the document database of this site may not be disseminated, copied, made available to third parties, saved, used or altered without prior consent from Future Leads Publishing. All rights are reserved. You may use a limited amount of data generated by you (“bookmarked or collected and user edited content: e.g. “policy reports”), download or print this data whether in print or electronic form in providing research and communication for internal use of your organization or private use only. While we take great effort to provide highly relevant und useful content to our clients, we cannot guarantee the accuracy and reliability of any information on this website. Future Leads Publishing GmbH shall in no event be liable for any direct or indirect loss, damage or expense connected to information published on this website. We intensively work with links to external sites to provide fast access to relevant documents and articles. The content you get re-directed by the link is maintained by third parties and Future Leads Publishing has no influence whatsoever on their content, infrastructure or design. Future Leads Publishing is not liable nor responsible for any possible content, criminal activity or danger from these external sources. 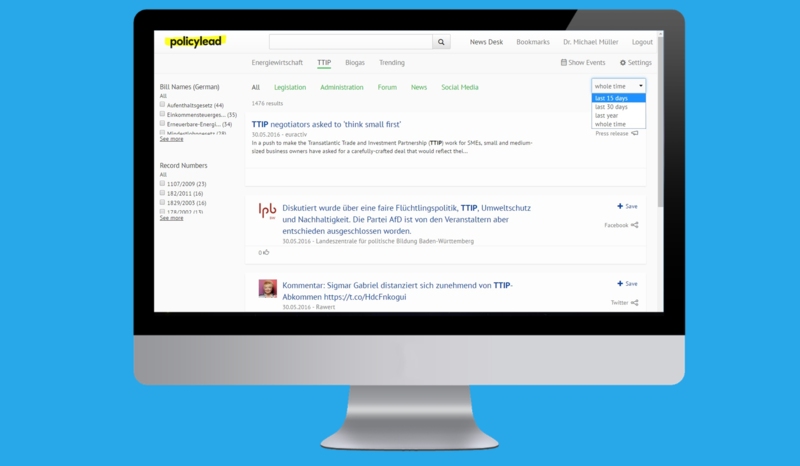 Access to some content, functionalities and news services of our news delivery platform ‘policylead’, require subscription and may be subject to a fee. Future Leads Publishing and its client agree on a license fee, first date of service and elements of service defined in an order form that is valid only by signature of both parties. User access that is free of charge can be terminated or suspended to all or part of the Sites (including any right to access and use the Content) with or without cause by delivering notice to the user. The initial term of paying users shall be automatically renewed for successive one-year periods, except as otherwise set forth within such Order Form, unless either party elects not to renew by giving the other party not less than 60 days’ prior written notice. Future Leads Publishing will not be liable or deemed to be in default for any delay or failure in performance or interruption of the delivery of the content resulting directly or indirectly from any cause or circumstance beyond its or their reasonable control, including but not limited to failure of electronic or mechanical equipment or communication lines, telephone or other interconnect problems, computer viruses, unauthorized access, theft, operator errors, severe weather, earthquakes or natural disasters, strikes or other labour problems, wars, or governmental restrictions. When terms are changed, Future Leads Publishing will publish these changes. If you do not agree to be bound by those changes, you should not use the sites any further after the changes are published. Access to certain content may be subject to additional terms and conditions. These Terms shall be governed by, and construed in accordance with, German law. * Users can test policylead 14 days for free. Afterwards functionality will be limited, or the user will subscribe to a 12-month-license. Please contact us, if you like to subscribe or want to know more about our products. For students and members of parliaments policylead is totally free.